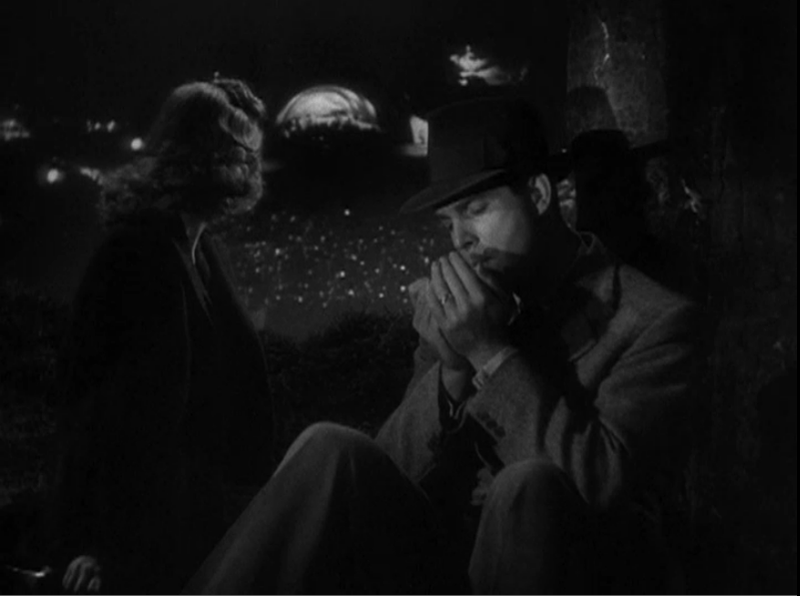 If you look at any lists of best film noirs you are likely to find that many people place Double Indemnity (1944) at the top. It's easy to see why. Billy Wilder's classic is dark, steamy and thrilling from beginning to end. Fred MacMurray, cast against type, gives a perfect performance as the insurance salesman who turns into a scheming killer. And not to be outdone, Barbara Stanwyck is one of the most seductive femme fatales to appear on screen. For me, an added point of interest is that so many of the scenes were shot on location around Los Angeles. Here are some of those dark and gritty locations as seen in the film and how they appear today. 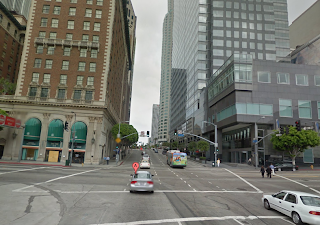 In the opening scene we see MacMurray racing through downtown Los Angeles on the way to his office building. 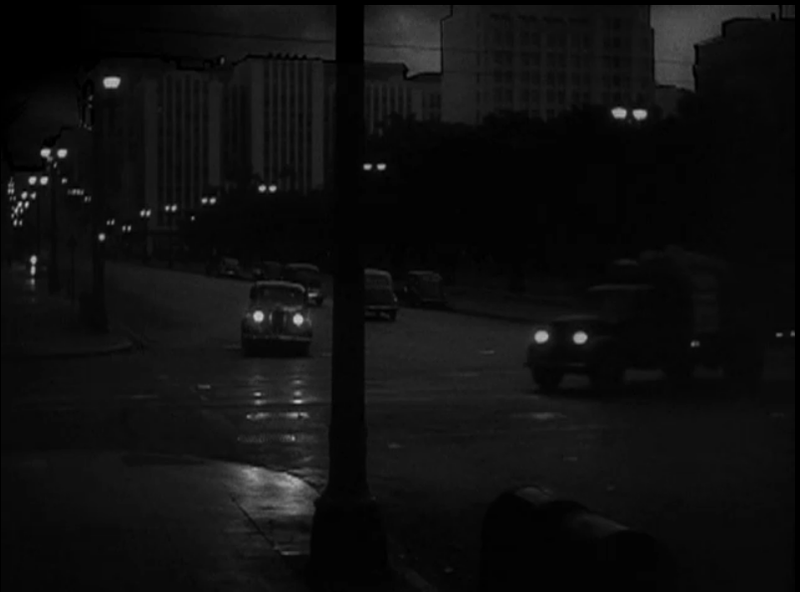 In the first shot MacMurray drives down Fifth Street, passing the Biltmore Hotel and then crossing Olive Street. In the comparison below, you will notice that the Biltmore Hotel is still standing on the left side of the image. On the right side of the image all of the buildings have been replaced by modern glass buildings. MacMurray races down 5th Street near Olive St.
5th Street at Olive Street. Biltmore Hotel on left. 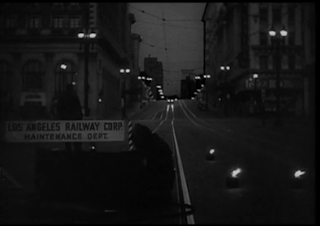 In the next shot we see MacMurray's car whiz down Olive Street coming towards Fifth Street. One of the buildings we see is the Philharmonic Auditorium built in 1906. In 1938 the facade of the building was remodeled and given a more streamlined look. The building has since been demolished. MacMurray drives down Olive St. towards 5th St. The Philharmonic Auditorium building is in the background. Olive at 5th Street in 1984. The Philharmonic Auditorium is still standing. Contemporary view of Olive at 5th Streets. The Philharmonic Auditorium is now demolished. In the background is the Subway Terminal Building. Above is a scene of Fred MacMurray leaving the Dietrichson house where Barbara Stanwyck's character lives. Below is the same house today. Getting to the Dietrichson house can be a little tricky. To get to this home located near the top of the Hollywood Hills you must drive up a series of very narrow and winding streets. Some are one way only because the streets are so narrow. Once you get to the top you will have a beautiful view. Below is a screenshot of the view from the Hollywood Hills and a picture of the view today. Above is a screenshot of the Newman Drug Store. The building is still standing but the Newman Drug Store is long gone. When I rewatched this film I recognized the drug store from the book, The Story of Hollywood, which shows many Hollywood buildings as they used to be, as well as many buildings that no longer exist. This building is located at the Southwest corner of Hollywood Blvd and Western Avenue. Hollywood Blvd and Western Ave.
One of the main points of action in the film takes place at the Glendale Station located at 400 W. Cerritos Ave, Glendale, CA. Below is the shot of the station in the film and how it appears today. It's here where MacMurray's and Stanwyck's characters dump the body of Mr. Dietrichson. August 7, 2013 - CORRECTION! - The Train Station is NOT the Glendale Station but the Burbank Station (now demolished). Click here to see another image of the Burbank Station before it was destroyed. To see more vintage views of the Glendale Station visit John Bengtson's post on the silent film Wings and the noir Act of Violence. Visit this post at I AM NOT A STALKER for more on the Glendale Station. Thanks John for the clarification! During the movie, Lola Dietrichson (Jean Heather) and MacMurray visit the famous Hollywood Bowl located at 2301 North Highland Avenue. Like in so many other movies, Heather and MacMurray don't go through the entrance, but instead climb up the back hill and watch from the top. The Hollywood Bowl as it appears today. If you're looking to track down these locations yourself I recommend starting in downtown Los Angeles early in the morning before traffic gets too bad and then working back towards Hollywood. As this is one of my favorite films, this marvelous post was indeed, very welcome! If I ever visit Los Angeles, The Dietrichson House would be the top on the list of places to see, no doubt! Thanks for the fabulous info about the sites of Double Indemnity! I watched it again today on TCM and was reminded what a fabulous film it is. This is your best post... EVER! Thank you so much for this. I'm amazed how similar things look but how different too. The Dietrichson House was my favorite. I e-mailed this to everyone! Is the Dietrichson House in Whitley Heights? This was such a great film! Thank you for posting this information. Sebina - Thanks for the comment. If you do come to LA and visit the Dietrichson house you will be near so many other old Hollywood locations. It definitely wouldn't be too far out of the way. Plus the view is great! Amanda - Wow, how wild that TCM was just playing the film. It really is a great film. I've liked Fred MacMurray and I especially like seeing him play seedy characters. Raquelle - Thanks for notifying others about this post! Glad you liked it. It is wild how the locations look so much the same but yet different. I'm happy when I find places that still look the same. Sometimes you come to place and it's been destroyed or changed so much it's not even recognizable. Thanks again! Hi Katie - You know, I'm not exactly sure on the borders of Whitley Heights. I can tell you it's in the area where Beachwood Canyon leads up the hill (near where the 101 Cafe is). Thanks for comment! I love that film. Great photos. I hope you had a nice weekend. Wow! Seeing the Dietrichson house alive and well, as it were, gave me a weird feeling... I usually say one of my favourite things about the studio system is the absence of real location filming as opposed to the artificiality of the studio - still do think that aesthetically... but just once in a while, to come across something like this is amazing. Even in the photo, that house still seems shrouded in atmosphere! So glad I've stumbled across this fascinating site. This my favorite film noir! And I love the pics you have of set locations. I always find it amusing when MacMurray's character narrates his story, and mentions the the "Dietrichson House," says something like this: "the house looked like one of those old Spanish houses designed back in the day, and it must've cost around $30,000." The house must be worth millions today...well then again, housing is bad today. But even with that, never $30,000. Great post! Awesome post! And one of my favorite films! I always wondered where the Dietrichson House was. Next time I visit LA, gonna try to check these out! Great, great write-up and pics; you'll be hard pressed to top this one, though I know you will! 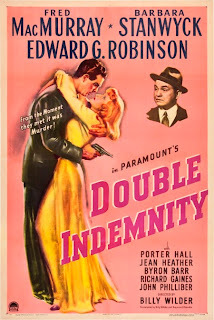 I think that "Double Indemnity" captures my conception of the Chandleresque Los Angeles better than any other film. The Dietrichson house in particular. Don't know if the interior (when Stanwyck is coming down the stairs) was a studio, but it still conveys such a dusty, decaying, sun-baked realm. Awesome stuff! I've just wandered over here thanks to the link on C.K. 's wonderful Hollywood Dreamland blog and this place is outstanding. Double Indemnity is a film that, although I did initially like it, has only gotten better with multiple viewings. One of the two noirs that I consider to be the very definition of what the style was all about. Again, awesome blog... look forward to keeping up with it. I toured that house 15 years ago after the Northridge quake when it was for sale. Chimney fell, etc. The inside looks like it did in the movie, especially the staircase by the front door. What a thrill. Went right home and watched it again. What a treat! Talk about turning a tragic event into an opportunity ;) How fortunate you were to be able to see the inside of the home while it was up for sale. Interesting to hear that everything looked pretty much the same as the time of the film. Love this post. This is one of my favorite movies. What a classic! The Bradbury Building is used in many, many films but "Double Indemnity" is not one of them. Look closely at the screen shot you posted: it shows the interior of a two story lobby. The Bradbury Building has a five story lobby. It would be interesting to know what interior was actually used for that shot. Anyone know? I either saw or read somewhere that the office lobby interior is a built set that mimics the interior of an another famous LA building. If I run across the passage will quote it. Thanks Charles for pointing that out about the Bradbury building. I should have known better! 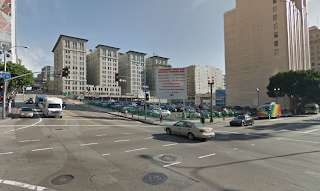 Dr. Bitz, you may be right about the location being a built set to look like another building. Now I'm curious to find out. Hopefully someone can chime in with the answer on that. 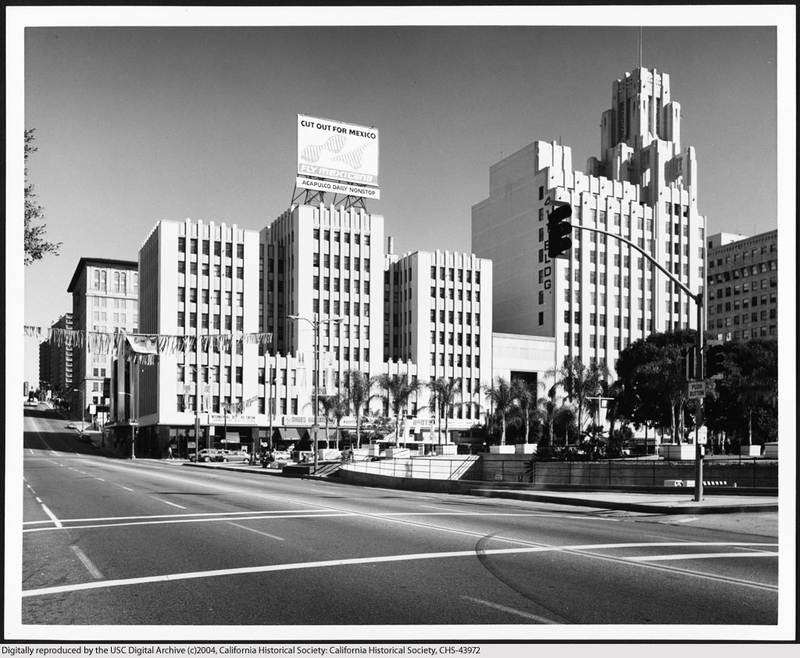 Thank you for your photos - I love Double Indemnity and I'm fascinated by art deco Los Angeles. I reckon the interior of Neff's office is an actual location, it doesn't look like a studio set. If it is, hats off to the art director. 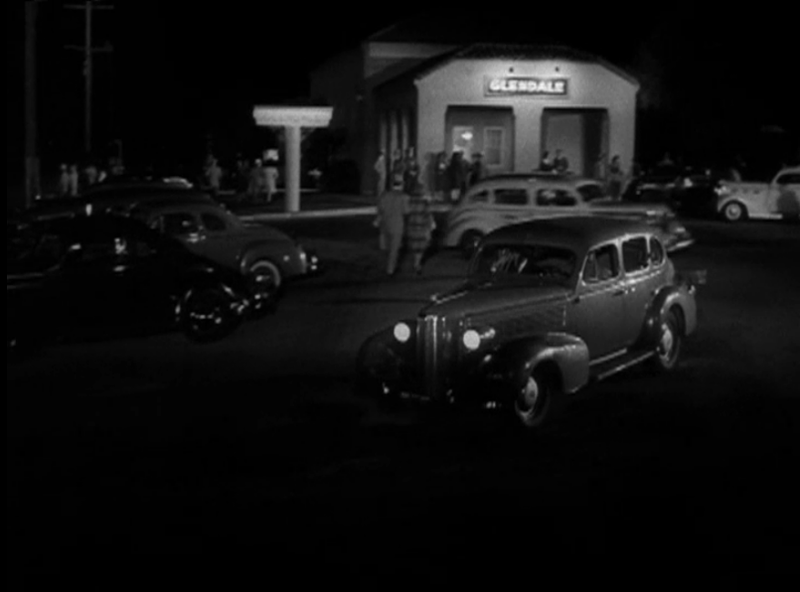 There was an article in an English newspaper recently that states Raymond Chandler actaully makes a brief cameo at the beginning of the film. Just after the scene in Key's office with the truck driver, Neff exits and goes to his own office. He passes a man reading a newspaper who glances up. This, apparently is the great man himself. I've just found the original article in The Guardian newspaper. Chandler is reading a paperback in his cameo, not a newspaper. Do the apartment doors at 1825 N. Kingsley open into the hallway? I love this film, but I always laugh when I see the scene where Robinson comes to call on MacMurray. Stanwyck needs to hide so they have the front door open into the hallway; she can now hide behind the open door. You know, I've never been inside the apartment so I don't know what the interior looks like. However, I imagine the interior scenes of the apartment were probably constructed on a soundstage. Sorry, I should have made it more clear that I was writing that as a joke. 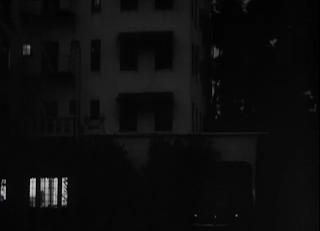 I have never, ever seen an apartment front door open into the building's hallway--like it does in "Double Indemnity." I think it's funny that they did that; so Stanwyck could hide as the two men talked right in front of her. Nice job Robby. 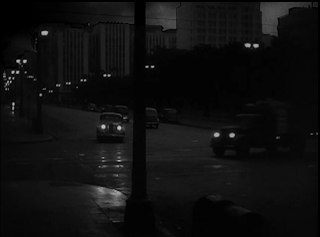 "DI" is one of my favorite noirs. I treasure every location shot that these visionary directors included in their now classic works of art. The two things that struck me most about your then and now shots. The street lights of noir LA so visible in the shot of the Newman Drug Store helped provide the city with an ambience that is now lost forever. The addition of a security fence in the shot of MacMurray's apartment reminds me that even though we have been exposed to noir LA through crime dramas, the actual crime rate of that era was much much lower than what is experienced in major American cities of today. Such a simpler and dare I say more romantic time period. i recently viewed some photos of the old central library location when it was in the metropolitan building at 5th and broadway from 1914 until the completion of the library building at hope and 5th in 1926.
the library was located on the 8th and 9th floors. 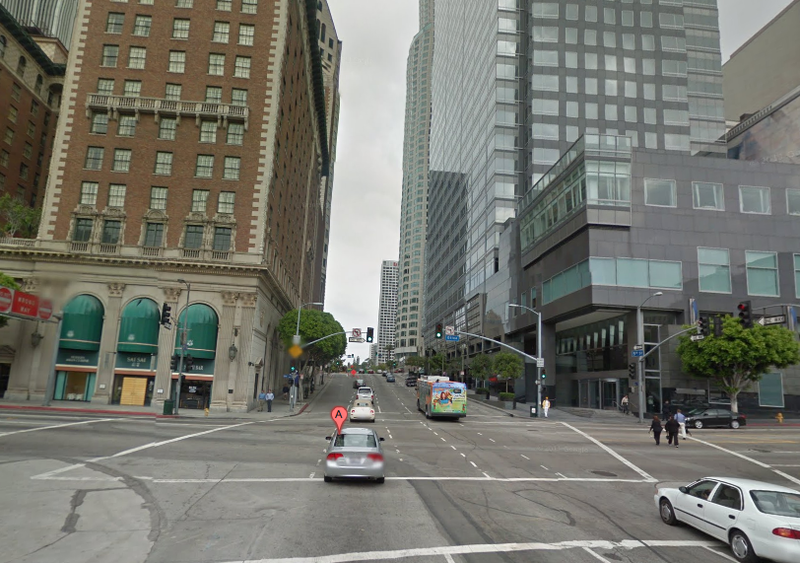 i'm somewhat inclined to say, that this was either the location of the pacific all risk insurance office in the movie, or at the least, the inspiration for it. 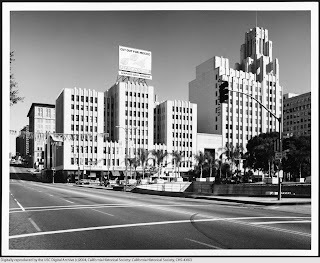 Thank you for writing this post about the Double Indemnity locations. As a fan of film history, Los Angeles history and architecture etc. I've really enjoyed your blog. I wrote a post on my blog about Noir and Double Indemnity and put a link to your post. Thanks for the kind comment and for sharing the link! I'll check it out. I think I've pinpointed the husband's murder location. It is on Revere Ave. In a screenshot, the old Tam 'O shanter Sign and Tower is visible on Los Feliz Blvd. and one block further on they turn to lead the husband down a dark street. Today that street is Revere. At the beginning of your article, you have the production date as 1949. The film was actually produced in 1944. A terrific article-love the photos. Cinespia cemetery screenings are back!